From age 13-20, Howe was “bound out” to a farmer, and proved to be an excellent farmhand, described as “strong, willing, and industrious–but wild and reckless.” He married at age 23, and the next year was converted through the persistent witness of a friend. He immediately sensed the call to ministry. He spent a year under the direction of Jacob Markwood, then a presiding elder, and in 1858 was given his own circuit, which spanned three counties and took 200 miles to make a round. As Howe set out on horseback for the first time, he prayed, “Lord, if just one soul is won to Christ, I will take it as evidence of your call on my life.” That first year, over 100 persons were converted. Most meetings were held in private homes, barns, or outside. He battled snow and rain, forded swollen rivers, and sometimes got lost in the mountains. But he kept at it, year after year. Howe is described in these ways: six feet tall, commanding presence, the “characteristic optimism of a successful general,” strong voice, a good singer, a personality “chargd like a battery with vitality,” jovial, cheerful, enthusiastic. Howe led Virginia Conference for the next 20 years as presiding elder. From the ruins of the Civil War arose a conference with 13,000 members. He proved to be an excellent evangelist, organizer, and executive. Great revivals resulted in entire communities coming to Christ, and new churches began. He was not a general who stood behind the lines and issued orders to the troops. Rather, he was with them in the trenches, doing whatever needed to be done. And people loved him for it. It’s not surprising that he was very successful in attracting young men into the ministry. William Weekley portrayed a man of immense gifts, who could have gone far in other careers. But instead, he gave himself entirely to the Church. 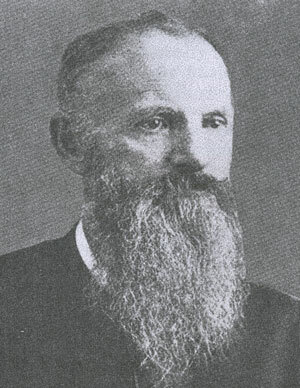 Howe was a delegate to eight consecutive General Conferences, beginning in 1869. He opposed the new Constitution which led to the division of 1889. But when the Church adopted it, he submitted to their decision and remained a loyal churchman (rather than split off with Milton Wright). Howe’s wife died in 1879 after 28 years of marriage. He remarried in 1890, and in the words of Weekley, “They walked together as the shadows gathered.” Howe died June 17, 1903, at age 74.